"People and animals are my favorite subjects, and they must convey movement and character." Joan Middleton began her career as a magazine and newspaper illustrator, graduating to children's books and later fashion design. After serving as an art director, she's been a commissioned portrait painter for the last twelve years. 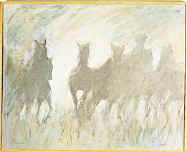 Disciplined in structure and form, Joan Middleton works in several media and is best known for action paintings of horses and dancers. Working primarily in oil, she fashions her portraits in an impressionistic vein, capturing the grace and elegance of her subject.